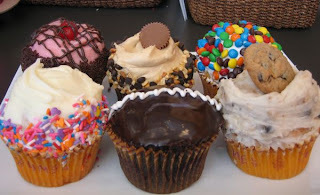 I know that anytime you mention Crumbs to cupcake lovers, they either love it or hate it. I would dare to say that those who love it don't usually like Magnolia and vice versa. But for me Crumbs is definitely one of my favorites in the city. Crumbs has a variety of unique flavors to choose from including cookie dough, oreo, lemon, hostess, red velvet, raspberry swirl, etc. etc. etc. It's hard to name a number one favorite out of all the delicious choices but I have to say that I have not been disappointed. The vanilla cakes tend to dry out faster than the chocolate but depending on the freshness of batch, I think you will be satisfied. And the cupcakes are HUGE. You are definitely getting your money's worth with these beauties. Check them out for yourself.